by A.J. Jacobs and found that it combined together solid information with humor and heart (literal reference not intended). Jacobs previously wrote The Know-It-All: One Man's Humble Quest to Become the Smartest Person in the World (about reading the encyclopedia) and The Year of Living Biblically: One Man's Humble Quest to Follow the Bible as Literally as Possible so this latest effort was very much in line with his style of books. Overarching premise - True, stuff can still kill you regardless of your actions, but that shouldn't be used as a cop-out for not trying to be (at least moderately) healthy. 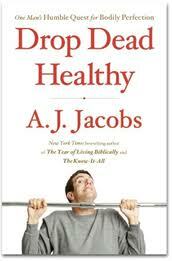 So... there's a bunch of content listed out and this could of course been done by someone without it being a several hundred page book, but Jacobs really does craft an entertaining yarn around being healthy. Good book and definitely recommended.